Came in late yesterday afternoon. 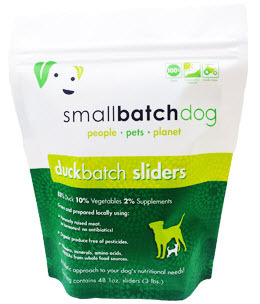 Smallbatch Pets has announced it is voluntarily recalling a select lot of its Duckbatch Sliders frozen dog food because it may be contaminated with Salmonella and Listeria. March 26, 2016 — Smallbatch Pets Inc. is voluntarily recalling one lot of frozen dog Duckbatch Sliders due to their potential to be contaminated with Salmonella and Listeria monocytogenes. The following image was copied in good faith by The Dog Food Advisor from Smallbatch Pets’ website and may not be a true representation of the recalled product. Eighty cases of the affected lot of dog Duckbatch Sliders were sold between the dates of February 23, 2016 and March 10, 2016. Salmonella and Listeria can affect animals eating the products and there is risk to humans from handling contaminated pet products, especially if they have not thoroughly washed their hands after having contact with the products or any surfaces exposed to these products. However, because of their commitment to safety and quality, Smallbatch Pets is conducting a voluntary recall of this product. Consumers should also follow the Simple Handling Tips published on the Smallbatch Pets package, when disposing of the affected product. This recall was initiated after routine testing by the Food and Drug Administration of a 3 pound bag of dog Duckbatch Sliders that was collected at a distributor revealed the presence of Salmonella and Listeria monocytogenes. Dear readers, the source of the above information is here. Do share this amongst your doggie friends!